If ya'll need to laugh at a few memes, that's fine, but you better realize immigration IS a Black issue after all. 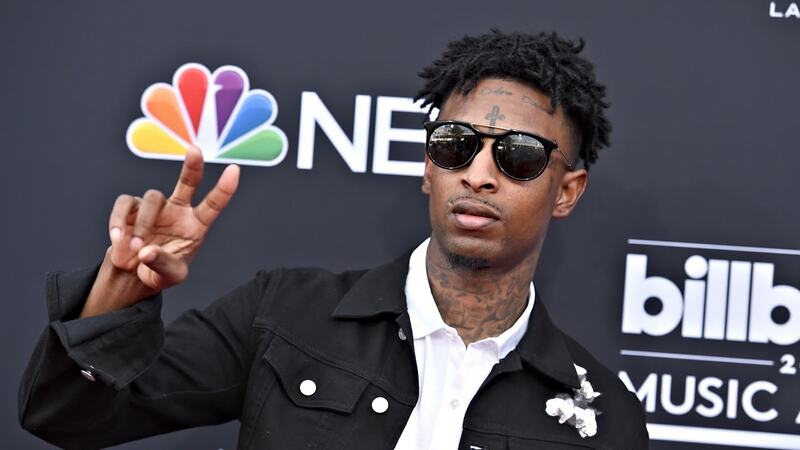 On Super Bowl Sunday many hip-hop fans were shocked by the news that 26-year old rapper, 21 Savage had been arrested and detained by U.S. Immigration and Customs Enforcement, also known as ICE. Up until that point many of us assumed that Savage, whose real name is She’yaa Bin Abraham-Joseph, was African-American. But once it was reported that he was actually a British citizen who has overstayed his visa, Black Twitter wasted no time turning the situation into a barrage of clever memes poking fun at the Brit who was secretly living in their midst. For the most part, immigration tends to be a topic that the Black community has precarious views on with many Black people born in this country taking the stance that they have their own problems to deal with and can’t be bothered fighting for immigrant rights as well. Which is why when political commentator Angela Rye, made the statement that, “Black folks are immigrants too,” during a January 11th segment of The Breakfast Club, it isn’t surprising that she received a lot of pushback from those begging to differ. The truth of the matter is, as a collective, most Americans treat immigration as a “brown” issue. When folks hear stories about ICE deportations it often conjures up images of someone being sent back to Mexico, El Salvador, Honduras or some other Central American nation. While it is true that nearly half of all deportations are indeed targeted towards these communities, sometimes what you guys would call “regular Black folks” get targeted too. It’s a shame that it took 21 Savage’s plight to drive this point home for so many people, and as a fellow immigrant myself, I would be remiss not to admit that the news of his detainment triggered some old feelings of fear and trauma. While civil rights violations are something that all people of color in this country face, immigration is an extra layer of terror that many of us have grapple with on a daily basis. Unless you’ve personally been through it, I can’t even begin to explain how swift and brutal the process of legal residency or even citizenship can be. There are people who have unceremoniously been yanked up by ICE at the beginning of the week, ripped from their families and “sent back” by the end of it. At first, I assumed that would be 21 Savage’s fate and rightfully so, that is UNTIL I found out that Black Lives Matter had gotten involved and was claiming this was an incident of racial bias and discrimination. Turns out I was wrong. Not only is this situation not as Black and white as the media headlines would have us all think, the more you look into it (which I did), the more obvious it becomes that this legitimately is a case of racial profiling and systemic oppression at the peak of it’s audacity. Let’s start first with the facts…. Usually when politicians, particularly conservatives, speak about immigration they stress that those seeking a home on U.S soil need to be reasonable and “fill out the proper paperwork.” What is perhaps the most ironic part of this case is doing things the right way, is what put 21 Savage on the government’s radar. In 2017, the rapper wanted to finally be seen as a U.S resident and contacted his legal team to start the process. Normally people who have been living illegally in the United states for 10 years or longer, but have a qualifying U.S. relative living here, are granted a U-Visa. Given that Savage has three American-born children who he takes care of financially, he is clearly eligible under those guidelines. In 2014, Savage pled guilty to felony drug charges, but had his record expunged in 2018. For those who aren’t clear what that means, expungement is a court-ordered process in which the legal record of an arrest or a criminal conviction is “sealed,” or erased in the eyes of the law. The whole point of getting a conviction expunged is to set aside a criminal conviction. In this case, that was done to ensure that this young man could get all the “proper documentation” immigration alarmists are always demanding. ALSO…can I just please point out that 21 Savage is only 26? That means he was a minor when he first arrived in the United States in 2005 and is now being punished for the actions of the adults responsible for him. DACA was implemented to prevent this very thing from happening. “As a minor, [Savage]’s family overstayed their work visas, and he, like almost two million other children, was left without legal status through no fault of his own,” explains his attorney Charles H. Kuck. Now, you’re probably wondering, if this is all the result of his adult guardians not filing the proper paperwork, and he hired a legal team to make things right when he had the funds (because trust me – this is a VERY expensive undertaking), then why is he being detained and threatened with deportation? ICE, who is now working under the regime of the Trump administration, has decided to ignore the paperwork expunging his record, and nullify his blatant eligibility for a U-Visa. “The Department of Homeland Security has known his address and his history since his filing for the U Visa in 2017, yet they took no action against him until this past weekend,” points out Kuck. This is not an unfortunate case of one official looking over Savage’s record and using his/her discretion to determine he’s a poor candidate for relief. The legal breadcrumbs tell a much more sinister story. ICE has a track record of disproportionately targeting people of color. These deportations have nothing to do with fighting crime or keeping our streets safe because only 5 percent of new removal filings were based on aggravated felony charges, and a meager 1.3 percent were on the basis of possible terrorist ties, according to data compiled by the Transactional Records Access Clearinghouse (TRAC) under the Freedom of Information Act. The rest of the people being targeted are just regular people contributing to our economy. “Before the Trump administration, courts would sometimes take into consideration factors and decide to not deport certain people,” explains Luis Mancheno, a New York-based immigration attorney explained to CBS News last November. Having ties to the community, owning property and being connected to family members already in the U.S., have always been reasons for a judge to choose not to deport someone. In fact, those are some of the very reasons I got to stay in this country, while I gathered the funds to pay my own astronomical legal fees to become a U.S. citizen. But now, ICE has taken up the mantra of “arrest everyone brown first and check paperwork later,” which has prompted numerous immigration and civil rights lawyers to file lawsuits about what amounts to a clear miscarriage of justice. This isn’t just an issue in border states either. In Pennsylvania they had to create new police guidelines, because officials were pulling over random cars and demanding people of color show their passports. The ACLU has even set up a page on their site to explain what to do if you are stopped by ICE. 21 Savage’s detainment is just the tip of the iceberg. So if ya’ll need to laugh at a few Twitter memes to blow off some steam, that’s fine, our people have laughed to keep from crying for generations. But after all the “LOL’s” subside, please be clear that overzealous immigration attacks are basically just a more clever iteration of the same racial profiling thats African Americans have had to endure for generations. Looks like some of ya’ll owe Angela Rye an apology because it turns out immigration IS a Black issue after all.